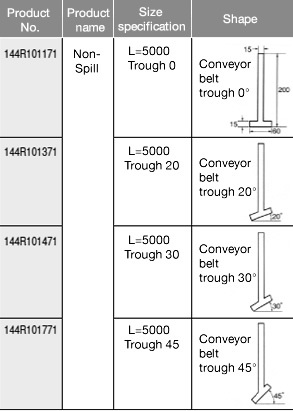 Impact Bar AR and Non-Spill | Conveyor Belts | Products | Bando Chemical Industries, Ltd. 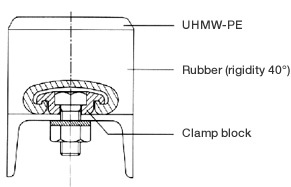 The rubber hardness of 40° provides high impact absorption and minimizes damage to the belt. 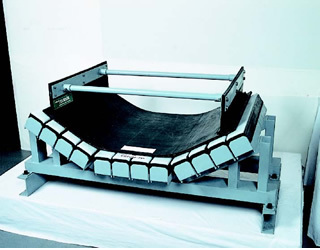 M = 0.08 to 0.1 coefficient of friction with rubber minimizes belt running resistance and keeps friction low. A change in the trough angle has no effect on the installed quantity. The standard gap is 5 mm without load. Installation of the impact roller before and after Impact Bar AR To fit the belt with the trough shape of Impact Bar AR, install the impact roller with the same angle as the trough angle between the tail pulley and Impact Bar AR. When using the stand frame of the JIS B8803-1990 rollers for belt conveyor, a frame is available for installing Impact Bar AR with a belt width of 450 to 2000 mm and a trough angle of 20, 30, or 45°. When using other stand frames than JIS B8803-1990, we design the frame based on the frame dimensions. A frame with a fixed tough angle. 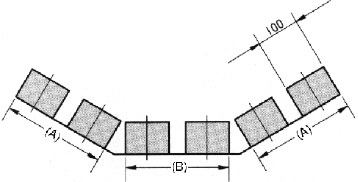 A frame that facilitates installation and maintenance by newly installing Sections (A) and (B) of the trough section with hinges so that they can be flattened at the time of repair and replacement. (Note 1) Do not use the product for a belt temperature of 60°C or higher. (Note 2) For use with a belt speed of 120 m/min or more, please consult with us. If you have any request for special rubber such as heat-resistant or oil-resistant rubber, please consult with us. If you have any request for other dimensions than the above, please consult with us.